👉🏻NNU means Nigeria New Update (It is a news platform). 👉🏻It is a secured website... i.e. https:// just like facebook, remita and other secured websites that don't spy or share your private information to third parties. 👉🏻They have products they sell; News - Just like Punch, The Nation, Sahara Reporters etc, Advertisers - They earn from advertisers (because they have huge numbers of registered members that can generate traffic for their advertisers). 👉🏻They also engage in other affiliate programs as the owner (Paul - A Tech Enthusiast) operates other online/information technology platform and earn legitimately. 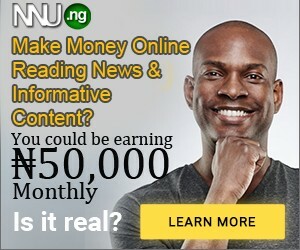 👉🏻NNU pays you #2 for reading news, #100 for sharing daily sponsored post on Facebook, #1000 for any success referral (optional though) and pays you when you post on their platform (this has been discontinued for the moment). 👉🏻It may interest you to navigate through their website to find published information and details of their payroll for previous months (people they paid in previous months). 👉🏻When you reach the minimum payout of #5000 you can request for payment and it will be sent to your account details (Account Number, Account name & Bank Name that you provided on their website - they will never ask for your password and don't provide it). 👉🏻After making your payment through him and gotten your coupon code, visit https://goo.gl/jeZMbh To register and begin to earn.